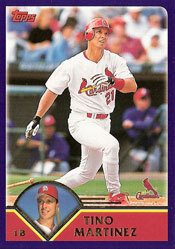 Cardinals players Tino Martinez and Mike Matheny were involved in an Easter Sunday brawl on April 20, 2003, at Busch Stadium. Martinez and Diamondbacks pitcher Miguel Batista sparked the fight. Bruised egos were the only serious damage either team experienced in the Holy Day melee. Leading off the bottom of the fifth inning, Martinez was struck on the shoulder by a Batista pitch. It was the fourth time Martinez had been hit by a pitch in the young season. The next batter, J.D. Drew, grounded to second baseman Junior Spivey, who tossed to shortstop Tony Womack, forcing Martinez at second base. As Martinez headed toward the dugout, he and Batista exchanged looks, then Martinez charged the mound, the Associated Press reported. Martinez threw a punch; Batista fired the ball at him. Both missed. Said La Russa: “The only thing I’m going to say is when you drill somebody and you stare at him like he stared, that is so unprofessional and so intentional-looking. I mean, he just stared at him like, ‘Hey, I meant to do it’ the whole time. Tempers flared again in the ninth. With two outs, reliever Jeff Fassero plunked Gonzalez with a pitch. Fassero and La Russa were ejected. In the bottom half of the inning, with the Diamondbacks ahead, 1-0, Edgar Renteria led off with a double and Jim Edmonds walked against closer Matt Mantei. After Scott Rolen and Miguel Cairo struck out, Drew was hit by a pitch, loading the bases and bringing Matheny to the plate. Eight years later, Batista pitched for the Cardinals and La Russa.